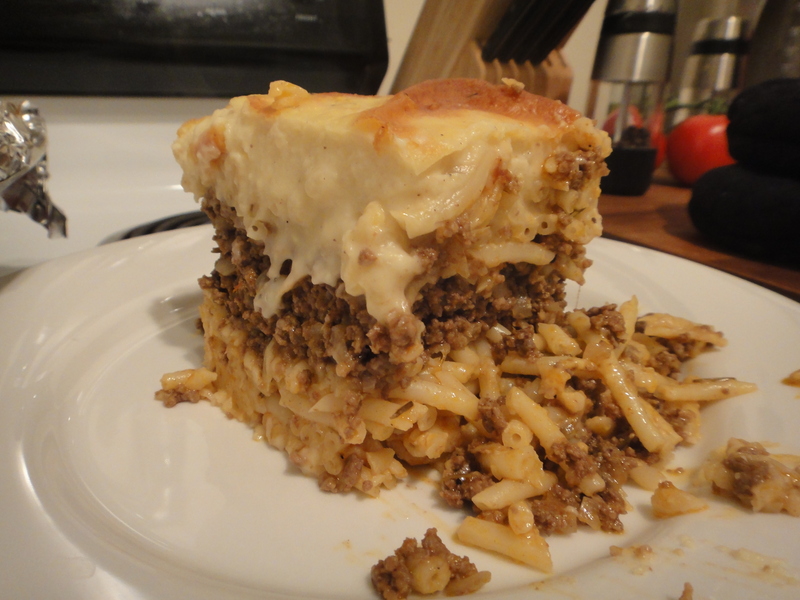 Branden loves Pastitsio and ever since his favorite Greek restaurant closed its doors forever, he has been yearning for a Pastitsio that even compares. There are a million different recipes for Pastisio, some with beef, some with lamb; some with a thick red sauce, some with a creamy bechamel. Branden and I both prefer the bechamel variety with lamb (or a lamb/beef combo), but we’ve been pretty hard pressed to find a recipe that comes close to what we like. We have finally found a recipe though that is a good starting point. I figured I’d start with posting the original recipe because we did follow it completely (okay, so we added an additional 1/2 lb. of meat – and swapped veal for a beef/lamb combo, but I swear that’s it!!). This recipe was good, but we have some ideas for the next time…starting with the bechamel. It was fine, but lacking a tad in flavor. Next time, the plan is to add some white pepper and a bit more nutmeg. We also couldn’t find the Greek Kefalotyri cheese, so we went with a young parm and I just don’t think it was sharp enough. We’ll be moving towards a slightly sharper parm (or driving the distance to track down Kefalotyri) for a bit more flavor. For the meat “sauce,” we decided we needed a bit more wine, more garlic and more salt…and maybe a pinch more of rosemary. Now don’t get me wrong, this recipe was very good as written, we just were looking for something a bit different. Its all about personal preference when cooking. Aaaaaand trying to recreate food memories. We’ll get there…eventually. By the way, here’s the original recipe. This guy’s blog is pretty cool and has some authentic Greek recipes…reminds me of my month in Greece. Sigh. Enjoy! My god look at that! Normally I like red sauce, but I think in this bechamel is the way to go. Looks amazing! Thanks! You have Branden to thank 100% for this guy! I agree…lamb and bechamel is usually what I have had. Recipes are all about trial and error. They take some fiddling with to achieve the taste you like.